Rebellion is the third extension to Sins of a Solar Empire. 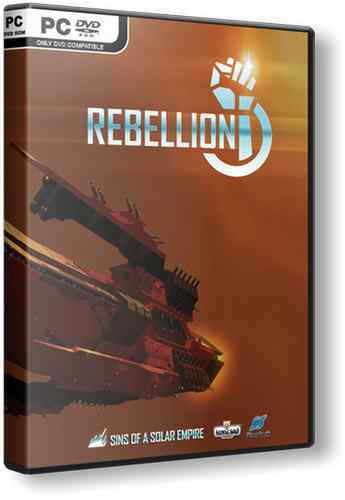 Rebellion includes new "loyalist" and "rebellious" subfractions that have exclusive access to new technologies and ship options. Innovations include additional victory conditions, large ("capital") ships for each faction, maneuverable Corvette class ships, and Titan class ships, capable of eliminating entire armies alone. Also in the expansion of the improved effects of lighting and particles, artificial intelligence, processor usage, support for modding. The independent addition of Rebellion adds three factions of the "rebels" to the game, duplicating each of the existing ones - traffickers, spiritualized mutant people and Vasari strangers (a warrior race fearing their own fear). Each of the six factions will have its own new class of ship "titan". Rebellion also adds other new classes of ships, a lot of new technologies and, quite importantly, it looks much better in appearance than the original game (high-resolution textures and all that). New factions: the players decide who they want to see themselves - Loyalists or Rebels. Both factions possess new unique technologies and ships. New class of ships - Titans: massive warships for each race. These new deadly monsters are able to destroy the entire fleet of the enemy alone. New flagships will provide players with new strategic opportunities. The new class of ships - Corvettes: small, very maneuverable light ships, designed to perform a variety of tasks. Modified versions of frigates and cruisers from the original game with their unique strengths and weaknesses for the Loyalists and Rebels. Updated lighting and particle effects to enhance the image. New victory conditions for a greater variety of different strategies and shorter game matches. Additional abilities of flagships for a greater choice of strategies. Impulse :: Reactor - chat support, friends, achievements and more. 1. Run setup, specify the path, install.